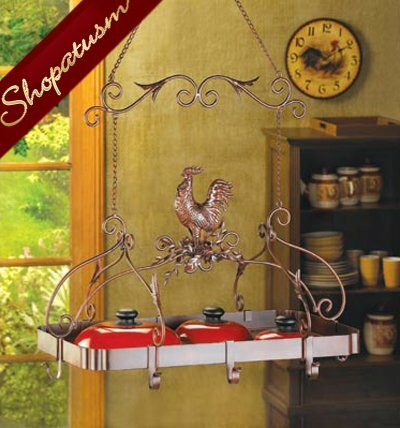 This is for a Country Rooster Kitchen Rack Rust Red Pot Holder organizer from Shopatusm. Attractive overhead rack puts your pots and pans right within easy reach; a must-have for any serious chef! Jaunty rooster and scrollwork theme and rich rust-red finish add informal elegance to your kitchen. Weight 7.8 lbs. Iron. Contents not included. Some Assembly Required. 23 inch x 15 3/4 inch x 34 inch high.